Farah Flossit here…wishing you all a lovely fall day! The month of October is not just about Spooky Monsters, but also about keeping the Mouth Monsters away! In light of National Orthodontic Health Month, I would like to share some tips from The American Association of Orthodontists. Ironically, the months of October through December are probably the busiest months for Orthodontists because of the re-occurring broken brackets and issues related to eating the wrong things during all the holidays. Say “BOO” to hard treats – including hard-shelled peanut candies, nuts or nut-filled candies, taco chips and popcorn (especially unpopped kernels). And whether undergoing orthodontic treatment or not, we advise that no one should ever chew ice. Spooktacular news: Not all Halloween candy is off-limits! Good alternatives include soft chocolates, peanut butter cups or other melt-in-your-mouth varieties. 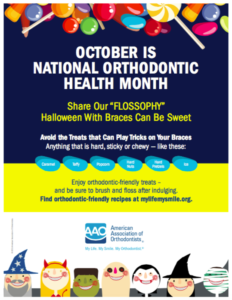 The AAO even offers orthodontic-friendly recipes for Halloween on its website here. Are you sweet as candy? 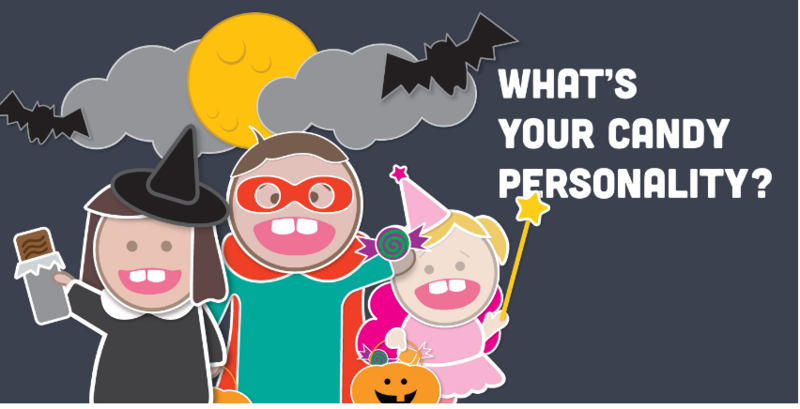 Take our Halloween Candy Personality quiz to find out! Plus, get expert tricks to scare the Mouth Monsters away for healthy, happy smiles all year long. You know your kiddos best…for those that feel that their kids will have a hard time making the smarter candy choices, stay tuned for this year’s non-candy treat ideas. With some creative and fun ideas, you can re-direct your little ones away from all the harmful sugar and toward some non-candy fun!